O’Donnellan & Joyce Auctioneers will offer 86 properties at its all day Wild Atlantic Way property auction taking place on September 28. This auction is the largest to be held in the west of Ireland with 46 Galway city and county properties as well as lots all along the western seaboard from Donegal down to Cork. O’Donnellan & Joyce is renowned for its extensive auction campaigns, marketing for four weeks in regional and national papers and radio, online platforms, plentiful open viewings per property, and the team offer constant support to sellers and buyers, being available six days a week. O’Donnellan & Joyce has more than 36 years’ experience and the team's vast knowledge of the region and the property sector in Galway and the Wild Atlantic Way, all of which help to make the company's auctions the largest and most successful in the country. Four/five bedroom detached family home located in one of Galway’s most sought after areas. This property would also be an ideal gilt edge investment as it is located within a stone's through pf NUIG and UHG. No 16 Tudor Lawn is first class with all amenities nearby including Dangan Sports Ground, Bushypark National School, Westwood House Hotel, IDA Business Park, and is only a short stroll from NUIG and UHG. AMV: €485,000. Open viewings Wednesday and Saturday 12.30pm to 1.30pm. No 18 Grangemore is a modern four bed detached property in a traffic-free cul-de-sac just off Rahoon Road. A splendid family home, this property would also make a wonderful investment property as it is located a short distance from NUIG and is on all major transport routes to Galway city centre. AMV: €375,000. Open viewings Wednesday and Saturday 11am to 12 noon. A three bedroom bungalow in excellent condition. Barr Na gCurrach is small development of bungalows located on the sea side of Furbo village. The development enjoys fabulous views of Galway Bay and the Clare hills and is close to all amenities in the village. Furbo Beach is a short walk away as are the shops, the church, bar, and restaurants. AMV: €290,000. Open viewings Wednesday and Saturday 12.30pm to 1.30pm. Five bedroom detached family home close to Galway city centre. The property is excellently located within a stone’s throw of NUIG and UHG and is considered one of the most sought after and convenient addresses in Galway city. Ideally positioned on an excellent road and bus network, all of Galway's amenities and services are within easy reach. No 7 is a four bedroom semidetached residence with a spacious rear garden. Ideal family home in a much sought after area of Knocknacarra. This property is ideally located close to all amenities and has a regular bus service to the city centre right on its doorstep and is within walking distance of McGrath's field, Knocknacarra church, Joyce’s supermarket, and Salthill. Fine semidetached three bed family home located in a new development built by Burkeway Construction. This property is the original show house and is presented in mint condition throughout. Maoilin is considered one of the finest developments of semidetached homes built in recent times. Perched overlooking Galway Bay and with stunning views of the Atlantic Ocean, Ballymoneen Road is close to Barna and only minutes from the nearby retail centre with facilities such as a supermarket, pharmacy, cafés, and restaurants. Outstanding family home in this sylvan setting. Stunning four bed semidetached period style property located close to Tuam town centre. This is the finest home to come to the market in this area and is in exceptional condition throughout. Modernised but maintains the old world character and charm. This property oozes style and class. Wonderful three bedroom terraced property located close to Galway city centre. This is an exceptional location being close to both the city centre and Salthill. The property is currently tenanted but will be sold with vacant possession. Three bed detached original farmhouse in need of some modernisation and a wonderful DIY project. Beautiful location just moments from the village of Barna. This wonderful community offers a host of amenities such as schools, shops, restaurants, and wonderful beaches. The property is just 15 minutes from Salthill village with Galway city centre approximately 10km away. AMV: €175,000. Open viewings Wednesday and Saturday 11am to 12 noon. This magnificent four bedroom detached family home comes with a one bed extension (flat ). The property is located near Craughwell National School, just off the old Dublin Road. Only 1km from Craughwell village centre and close to all amenities including transport links. This is an opportunity to acquire a private pier to moor your yacht. Extending to 0.11 hectare (0.27 acre ) approximately and located on the edge of Galway city, it is very easily accessed as it is just 250m off the Coast Road to Oranmore (R338 ). 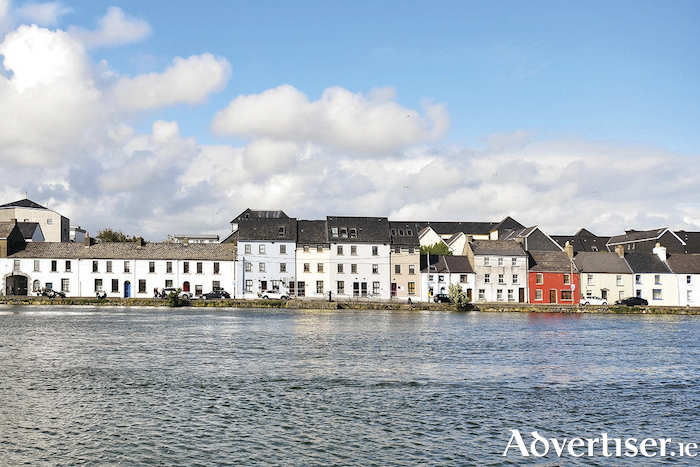 Galway city centre is less than 7km away and Oranmore train station is less than five minutes' drive away. Perfectly located just six minutes from the Galway to Dublin motorway (M6 ). For boating enthusiasts, this is living the dream — a boat house within walking distance of the city centre. Standing on a substantial site with frontage onto the River Corrib. Located only 500m from Galway city centre with access via pedestrian tree-lined walk on the shores of the River Corrib. A concrete block built structure, wired for electricity. Two bed ground floor apartment, featuring kitchen/dining/lounge, bathroom, and two bedrooms being sold with tenant in place. This property would prove to be an ideal gilt edged investment property, owner occupier residence, or a holiday home for those seeking ease of access to Galway city centre and all of its amenities. Viewing is highly recommended and guaranteed not to disappoint. Circa 19 acres of agricultural lands which were quarried in recent years. The property benefits from approximately 30m of road frontage onto a secondary road. The lands are located approximately 5km off the N83 Tuam/Dunmore road. Carrowrevagh is a rural townland 10km north of Tuam town and 15km from Dunmore town which has access to all necessary amenities. Two bedroom ground floor apartment situated in a modern development in the centre of Oughterard. This is an attractive development with communal green areas and off street parking. This would be an excellent investment property or starter home. Oughterard is known as the gateway to Connemara and is a well known tourist location. Modern 1,800sq ft warehouse unit comprising four ground floor retail units with 17 first floor offices. Several of the units are occupied while the remaining units are vacant. The property is currently generating a passing rent of €5,800 per month. Three bedroom bungalow located in Woodville, a short drive from the village of Kilchreest and approximately 8km from Craughwell and 30km east of Galway city. The property requires upgrading throughout and it appears that the rear shed and septic are outside the boundaries of the subject folio GY53997F. Modern three bedroom duplex apartment located on the second and third floors. Located off the main Galway/Headford road and within easy reach of Galway city centre and on a regular bus route to and from the city centre. The property is being sold with vacant possession. It offers spacious living accommodation and the overall development has been well maintained throughout. This would provide an ideal starter home or investment property.